The CHATILLON® DG Series mechanical force gauge is ideal for a wide range of force testing applications up to 500 lbf (2.5 kN). The DG Series features a large, 2.25-inch dial for improved resolution and readability, peak hold button, durable plastic housing, universal mounting plate, ergonomic shape and improved accuracy of +0.5% of full scale. 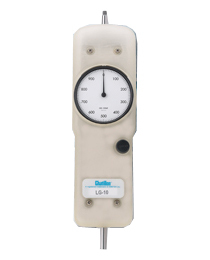 The DG gauge is an excellent, economical solution for tensile or compression testing. The DG Series may be used as a hand-held device or equipped with an optional handle set for two-hand operation. It is ideal for test stand applications, and when combined with the MT500 Series mechanical test stand, offers you a versatile, economic test system with a capacity of up to 500 lbf (2.5 kN). The DG Series features an an easy to read concentric dial that measures clockwise only. Dial rotates 360-degrees for taring. A peak hold switch captures peak readings and can be easily and quickly returned to zero. A mechanical overload feature protects the gauge from damage. Available in lbf, kgf or N units of measure. DG Series gauges come complete with protective carrying case and a set of stainless steel attachments. A Certificate of Calibration with NIST Data is supplied standard.